I grew up in Reading UK, 20 minutes by train from London. I went to Chiltern Edge Secondary School (11-16yrs) and Henley Sixth Form College (17-18yrs). After two years of working and backpacking I went to The University of York, UK, and did a Physics BSc. My final year project was on the nucleation of freezing in supercooled water, supervised by Dr Richard Keesing. We scattered a laser through droplets of supercooled water to observed freezing as it was initiated by the application of an electric field. Between 2009 and 2013 I did PhD in glaciology in the Department of Geography, Sheffield University, supervised by Dr Felix Ng. My thesis was entitled 'Modeling ice-dammed lake drainage' (pdf). 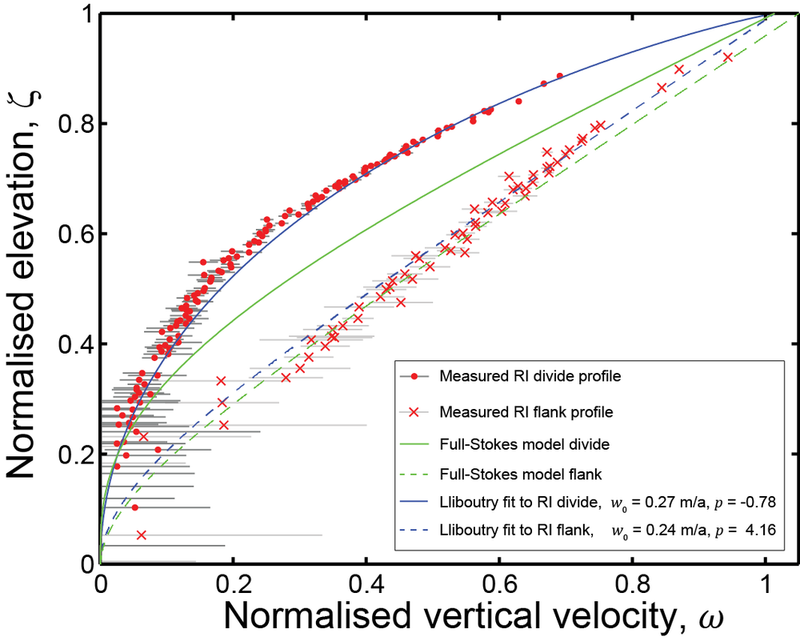 I used mathematical models to study how water flows beneath glacier (see research section). Between 2013 and 2016, was a Glacier Geophysicist at the British Antarctic Survey (BAS), Cambridge, UK. I was employed on a NERC-funded project led by Richard Hindmarsh. We used radar and mathematical models to study present-day and past ice flow in West Antarctica. In March 2016 my wife and I moved from the UK and I started my current position as Assistant Professor in the Department of Earth and Environmental Sciences, Columbia University, and the Lamont-Doherty Earth Observatory. My research is concerned with obtaining a better understanding of glacial processes to improve predictions of ice-sheet evolution. I advise a group of students and post-docs using remote-sensing, mathematical modeling and fieldwork to better understand glacial processes. Some details on the students and post-docs I help advise. Julian became interested in glaciology on a hot summer day in high school when his family's air condition stopped working. What first was a means of escaping the heat became a livelong passion towards understanding the history of ice sheets and the mechanisms that control glacial stability. Julian received a BS in Geophysical Science from the University of Chicago in 2016 and subsequently began a PhD at Columbia University, advised by Jonathan Kingslake. His research interests include glacial hydrology, glacial history, and ice-climate interaction. Julian is currently a third-year graduate student and is researching the surface hydrology of the Amery Ice Shelf in East Antarctica. Martin’s research centers on ice shelves – the floating areas of ice at the coast of the continental ice sheets. They are crucial for providing resistance to the flow of grounded ice. Martin uses uses idealized mathematical models, laboratory-scale fluid-mechanical experiments, and analysis of geophysical data, such as ice-surface velocities and ice-penetrating radar. In November 2016 he completed my PhD in Applied Mathematics at the University of Cambridge and British Antarctic Survey, with a thesis titled: The Flow Dynamics and Buttressing of Ice Shelves. Since 2018 he has worked a postdoctoral research scientist o several projects including the flow history of the Ronne Ice Shelf and ice flow around sub-shelf channels. Check out Laura’s websites here and here. Laura’s research focuses on the physical processes driving ice-sheet flow, with a particular interest in the interactions between ice sheets, meltwater, and oceanic forcing. Laura’s main tools are in situ geodetic, atmospheric, and oceanographic observations paired with numerical models. She completed a PhD in Geophysics in the MIT/WHOI Joint Program with a thesis entitled “Influence of meltwater on Greenland Ice Sheet dynamics” in September 2017. For her thesis, she worked on string of problems including triggers for supraglacial lake drainage, decadal ice-sheet flow in response to melt, near-ice hydrography and observations of subglacial discharge in fjords, and numerical modeling of the subglacial drainage system. Since arriving at Lamont, she has focused on a couple of projects including diurnal fluctuations in flow of Helheim Glacier, East Greenland, and the dynamic response of ice shelves to sub-shelf channel incision. Elizabeth started her PhD in 2017. She examines the deformation of ice through physical models and in-situ observations. Right now, she's working on understanding how old snow (firn) turns into ice. She uses phase-sensitive radar measurements from around Antarctica to estimate how the ice stretches (deformation), and how quickly layers in the ice move down relative to each other (vertical strain rate). 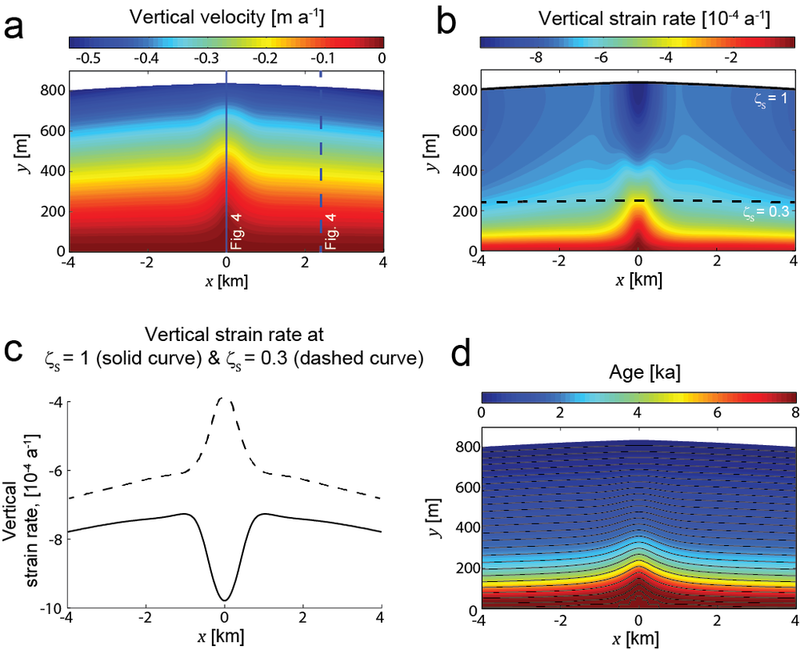 Disentangling this stretching signal from the vertical strain rate signal in the firn will help better constrain measurements of mass change. In her free time, she's outside -- climbing, hiking, or camping -- or making digital art. My research is focused on modelling and observing the flow of ice and water in ice sheets and glaciers. During my PhD I studied the flow of water beneath glaciers and ice sheets through the development and analysis of mathematical models. I studied how ice-dammed lakes fill and drain beneath glaciers, showing how simple models can be used to predict approximately when lakes will drain, lakes can fill and drain chaotically and lakes affect the flow of glaciers through their impact on subglacial water pressures. The Nye Attractor. This anaglyph, viewable with 3D glasses, shows the chaotic behavior of a model glacial lake. This is a section of an infinitely long curve called an attractor. It shows the evolution of a model glacial lake as it fills and drains, chaotically. The curve's distance along the vertical black axis is the flow out of the lake, its distance from the axis is the lake's depth and its rotation round the axis is time. It is named for the British glaciologist John Nye who devised the model in 1976. This anaglyph is designed to be viewed with 3D glasses. Kingslake, J. 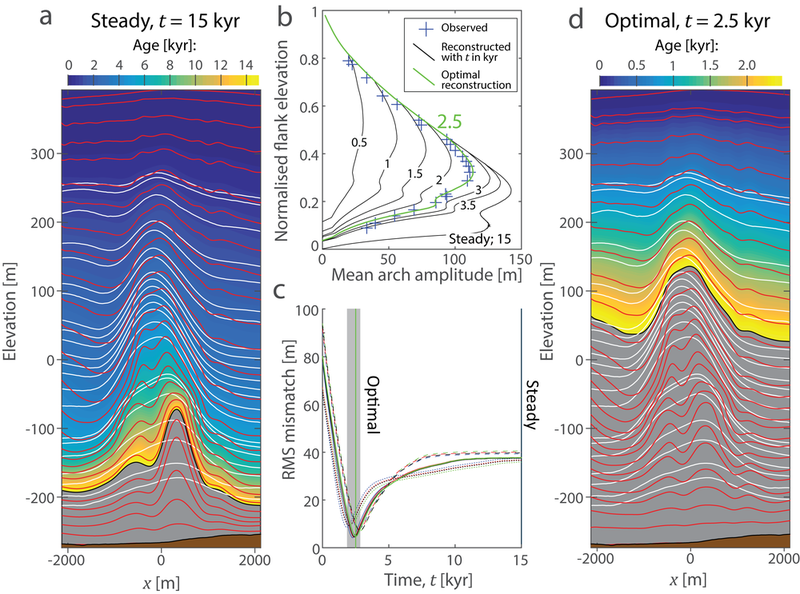 Chaotic dynamics of a glaciohydraulic model. J Glac. (61)227. My work at the British Antarctic Survey focused on using radar to constrain present and past ice flow in the Ronne Ice Shelf region of West Antarctica. We used a phase-sensitive radar system to measure an ice-dynamical phenomenon called the Raymond Effect. In a paper from 2016, we used phase-sensitive radar and GPS to infer vertical and horizontal ice flow fields throughout the thickness of Korff Ice Rise, West Antarctica. We used these englacial flow fields with radar observations of internal layers within the ice rise to show that the flow of his part of the ice sheet underwent a reorganization around 2-3 kyr ago. Continued research into the history of the West Antarctic Ice Sheet is bringing together geophysical and sedimentological data with ice-sheet modelling, to understand large-scale change during the last few thousand years. Though my PhD work was focussed on lakes that drain subglacially (beneath glaciers and ice sheets), I was also interested in surface melt ponds and how they drain supraglacially (across the surface of the ice). Both subglacial and supraglacial drainage can involve flow paths that grow due to frictional melting from the flowing water, so some aspects of these two types of drainage are similar. I modelled the physics of supraglacial drainage, finding that melt ponds can drain stably or unstably over the surface of the ice. Which style of drainage occurs depends on factors like the size and shape of ponds and the input to the lake from its catchment. This is potentially significant because these factors may vary systematically as the climate changes, and drainage style fundamentally impacts the amount of water that is drained towards the ocean. This work is published here. At Lamont I have been able to revisit supraglacial hydrology. Throughout 2016 I, along with Lamont colleagues, explored the supraglacial hydrology (i.e. hydrology that goes on on the surface of ice) of Antarctica. This has been exciting because only a few previous studies have looked at water moving across the surface of Antarctica, but we concluded that surface water flow potentially has an important role to play in the future of the Antarctic Ice Sheet. In two papers (here and here) recently published in Nature, and summarized in the same issue (here), we showed that water has been moving long distances onto and across many Antarctic Ice Shelves for many decades (possibly much longer). Our research is now focussed on understanding how these drainage systems operate and how they develop under changing environmental conditions. Julian Spergel, a PhD candidate in the Earth and Environmental Sciences department here at Columbia, is leading this work. This animation shows a series of images taken by NASA's LANDSAT7 satellite. Over a period of around 3 1/2 weeks this large pond on Amery Ice Shelf, East Antarctica, inundated an area of 55 square kilometers. These observations of widespread supraglacial hydrology in Antarctica are interesting because as the continent warms, water could either move into areas where it can cause ice shelves to collapse, or it could evacuate water into the oceans as shown by one of our papers. The movie below, taken from a helicopter, shows a large water fall at the front of the Nansen Ice Shelf. Kingslake, J., L D. Trusel, A. Banwell, R. E. Bell, I. Das, R. M. DeConto, M. Tedesco, J. T. M. Lenaerts, C. Schoof. Field observations are an essential part of my research. I have conducted fieldwork in Southern Norway, Svalbard, Greenland, Alaska and Antarctica. During two austral summers I spent two months traveling across the West Antarctic Ice Sheet in a team of two (a mountaineer and I), conducting measurements of the ice flow using GPS and ice-penetrating radar. Video and time-lapse from a skidoo traverse of the Ronne Ice Shelf conducted by the British Antarctic Survey during the 2013/14 Austral Summer. Time-lapse by Iain Rudkin. Music is "Jenny Island" - an unfinished composition by Steve Massey freezabox.com. 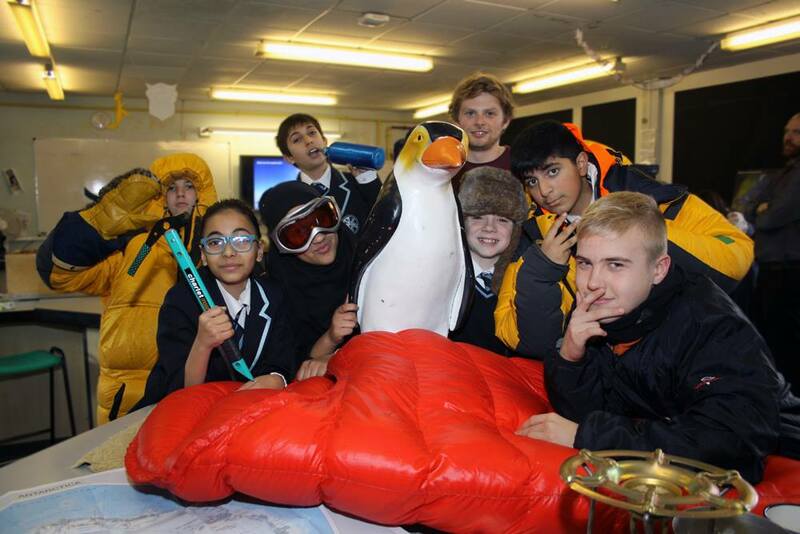 Video footage and compilation editing by Jonny Kingslake - a scientist at the British Antarctic Survey. In April/May 2017 I spent four weeks traversing across the Greenland Ice Sheet as part of an NSF-funded project to investigate refreezing of meltwater in snow and firn. The project is led by Asa Rennermalm, Regine Hock and Marco Tedesco. More details soon. Meanwhile, here are some photos and a movie showing some pretty windy conditions that we encountered on the ice sheet. In Summer 2018, funded by a Lenfest Junior Faculty Development Grant, Elizabeth Case and I conducted 2 weeks of fieldwork on the Juneau Icefield. This was in collaboration with the Juneau Icefield Research Program, who run a yearly six-week ski traverse of the ice field. We took a helicopter flight into the program’s camp 18, reproduced here as a 3D model recreated by Martin Pratt from video footage we obtained using a DJI drone. From camp 18 we moved up to the ice divide between ice flowing north into Canada and ice flowing south in the US. 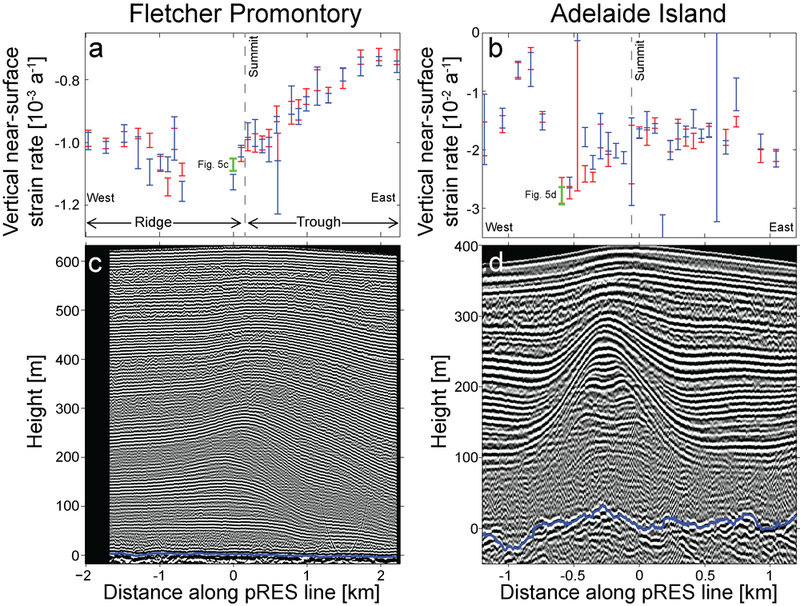 We used a phase-sensitive radar to conduct a grid of point, aiming to measure vertical englacial strain rates (including firn compaction) and we used a shallow coring system to extract around 80 m of ice core from 6 locations around the ice divide. Juneau Ice Field, Summer 2018. 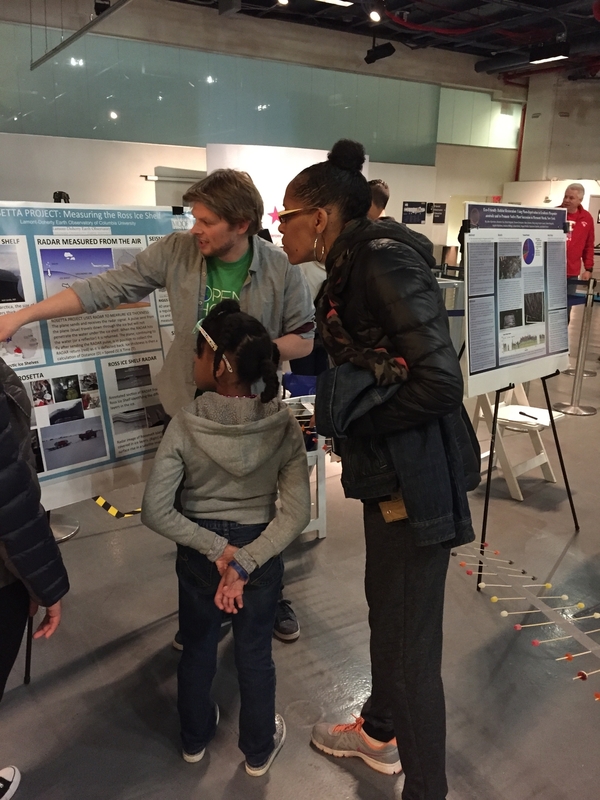 There are loads of opportunities for outreach at Lamont, with regular outreach events including the Women in STEM event at the Intrepid Air and Space Museum﻿, the Earth-Sun Day at the American Museum of Natural History, Hudson River Sailing Community Sailing Club and Lycée Français de New York school. The biggest outreach event of the year for everyone at LDEO is Open House. At Open House 2018 we ran a full range of ice-related outreach activities including a large-scale glacier goo demonstration, where everyone can get in and play with the goo, an Augmented Reality headset that allows people to manipulate a model of the Himalayas, a google Earth tour with 3D mouse and a glacier-goo feature-tracking demonstration. A quick look round our science outreach exhibits on ice at Lamont-Doherty's open house this year. We had a large-scale glacier goo, Augmented Reality with the Microspft Hololens, a google Earth tour with 3D mouse, and a glacier-goo feature-tracking demo. Recent travels include backpacking around the Philippines and a road trip across the United States. Our route across the US was approximately this. Below are some photos from some recent trips.